A long time without updates…. I finally reached melting point with the gnome which ships with Solaris 10, and so I decided to take a look at some other window managers. 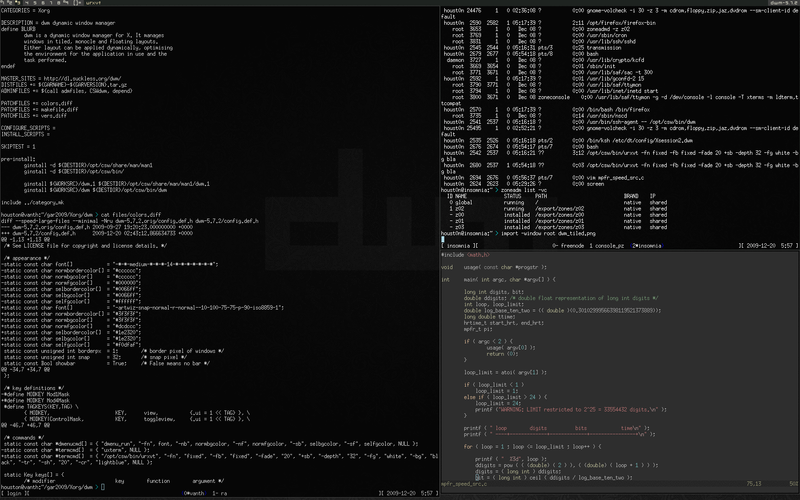 A bit bored of Flux and Openbox, I finally settled on DWM. For those of you who don’t know – DWM is an exceptionally lightweight window manager (weighing in at just over 2000 lines of C) which has no configuration outside of config.h, and should be pushed out with the next release over at blastwave (my sources tell me this will be today). 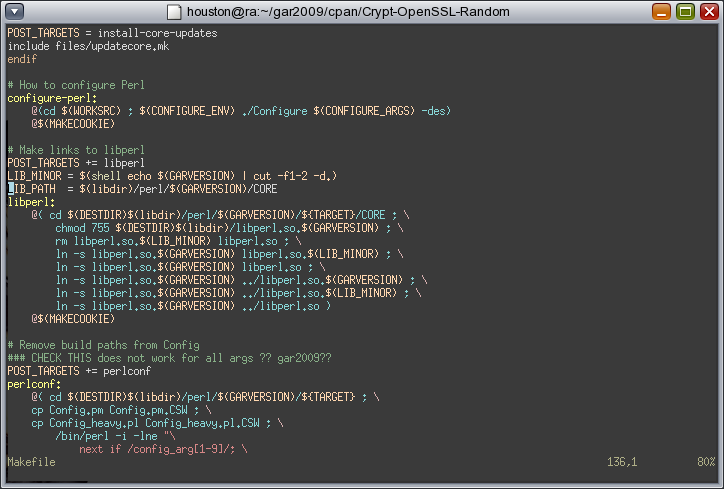 This will pull down DWM itself, the dtlogin integration files (/etc/dt/config), urxvt and the artwiz fonts. 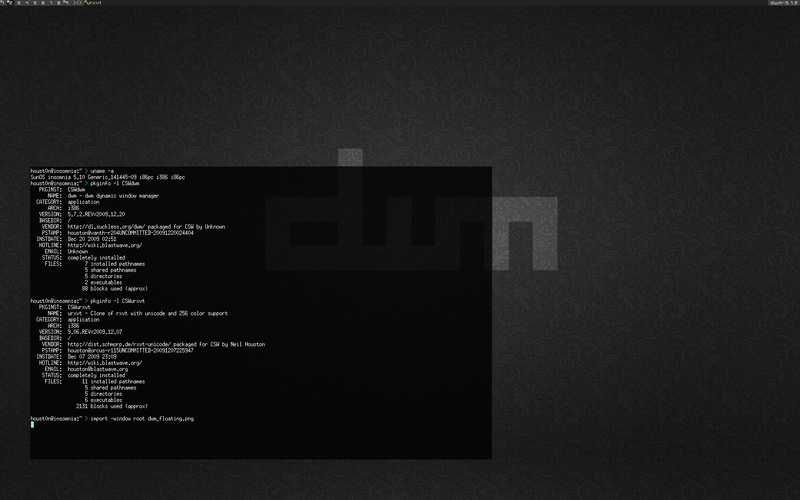 Select DWM from your sessions list in dtlogin, and press MOD4(Windows Key) + Shift + Enter to open a terminal. I’ve added DMENU to the repo for those who want it, too. I’ve been back in the real world for a few weeks now, and of course the first thing I needed to do was set up a workstation. Initially, my first choice was opensolaris-dev (in this instance, build 127) which turned out to be a rather painful experience. 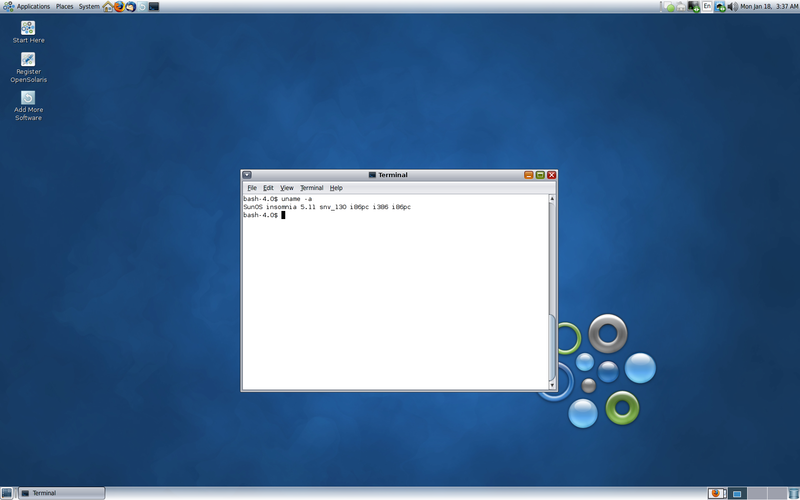 Besides the random crashes, 10 minute boot times and broken audio drivers, the real problem for me is that opensolaris has one of the worst packaging systems ever made. Many people with much better prose than mine can explain the problems with IPS, if they weren’t painstakingly obvious from the moment you first used it – so I’ll leave that rant for another day. So, I went off to sun.com and downloaded the latest Solaris 10 release and stuck it on my machine, and so far everything is working great – and compared to OpenSolaris it’s rock solid stable. To make it more usable, the first thing I had to take care of was the lack of a decent terminal program, the gnome-terminal that ships with Solaris 10 is terribly dated, and when I’m inside vim and the cursor is over a comment, it disappears! So I logged into the blastwave farm and made a package for urxvt, which should be available in the repo soon! Next up was to install the latest Firefox which you can download from their website. Things have been pretty crazy with quitting my job and getting prepared to relocate 10,081 miles from here in Scotland to Brisbane, Australia. So, the gory details: I’m landing in Brisbane on the 13th if anyone wants to hook up for a beer, if not – I might catch you at the next QOSUG! I’ll post some more Solaris related stuff as I get the chance. In related news – we over at Blastwave have been rather busy, expect some cool new things (Including FreeNX!!!) soon!